On a Sunday afternoon when the entire city seemed to be at the beach, or riding bicycles, or visiting the Old Town Art Fair; on a Sunday afternoon when the air was breathtakingly clean and the sun burned away the memory of our two months of rain; on, in short, the finest Sunday afternoon so far this year, I found myself watching "Terminal Island." Pfaugh. It's the kind of movie that can almost be reviewed by watching the trailer, if not the TV commercials. Everything they tell you is true enough, but there's nothing in the movie except the high points. The rest of the time, everybody stands around in awkward groupings, discussing the last high point and planning the next. 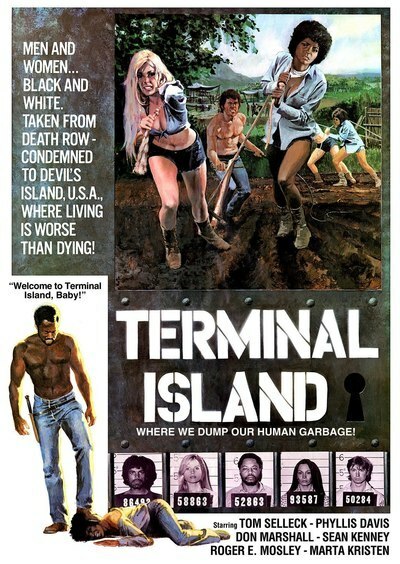 The movie is about a group of condemned criminals who are placed on Terminal Island to fight it out. Well, it's better than the death penalty. The island is furnished with several grass huts, a goat, and apparently, a great beauty salon for the women. All of the people on Terminal Island are about the same age - which is to say, somewhere between Tatum O'Neal and Tab Hunter - and they are all good-looking. Especially the girls, who manage to run forever through the underbrush while keeping that sheen in their hair and their makeup on. I know girls who can't run for the bus with those kinds of results. Anyway, there is a lot of running, and some grenade throwing, and great use is made of those Hollywood special-effects gimmicks that make it look like you just got shot. One guy's gimmicks kept exploding for about three shots after the gunfire stopped, which was a novel effect, albeit poignant.